Hi Renee and David, Thank you ! ! ! Your programs are always brilliant. You've presented very sophisticated concepts in an easy to understand context. I especially want to thank you for your advice about when he withdraws, why, and what to do about it – fill up my life. Hope to read more from you soon. Dear David and Renee, This, by far, was the most enlightening program for me…gives me permission to accept all of me. By the way..The gentleman I am dating asked for exclusivity this week. Nice to know we are moving forward. I tend to feel that your course has changed my attitude and views which facilitated this step forward in my relationship. Thanks for your course and for being there. What's included in the platinum version? 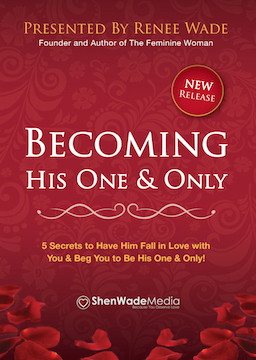 4) In case you love to read, we've put together an Extended PDF version of Becoming His One & Only with some bonus content that didn't make it to the DVD. 5) There's one more secret bonus that we won't announce here yet. You will discover what this is in due time. What format is the platinum version content? All of the content inside of the platinum version will be hosted within our secure library portal. The content will be mostly presented in video format, with multiple downloadable options. All of this content will be immediately available to you when you order the platinum version. What if I don't like the platinum version? No problems! If for any reason or no particular reason you don't like our platinum version, just let us know through our help desk. We will promptly issue you a full refund and we can stay as friends. Not every program is for every person, and that's why we always offer a 30 day raving fan guarantee with ALL of our products. However, the shipping cost for the DVD itself cannot be refunded. Will I still receive the DVD with the platinum version? Of course! I would never want you to miss out on holding this DVD in your own hands. I want you to keep this DVD at home in a special place knowing how transformational it has been in your life; and have the ability to watch it any time you wish.